Google Spreadsheet, the spreadsheet app of what was formerly Google Docs and is now Google Drive, already lets you do pretty cool things, including making your own RSS reader Create an RSS Feed Reader Using Google Spreadsheet Create an RSS Feed Reader Using Google Spreadsheet Looking for a more practical, everyday use for my growing collection of Google spreadsheets, I decided to see if I could use one function I haven't covered here at MUO yet called "ImportFeed", to try... Read More . Well, Google’s now amped it up with more functionality, including offline support and some cool features. Google Docs and Slides have worked offline for some time and Google Spreadsheet is now getting the same treatment, provided you’re running Chrome. While you can’t create new spreadsheets, you can edit existing ones offline, which will be synced when you reconnect to the Internet. It’s a one-time setup. Of course, if you aren’t yet set up, Google Drive lets you store your files Access Your Files From Anywhere With Google Drive [Android] Access Your Files From Anywhere With Google Drive [Android] If you’re using Google Drive on your computer and you own an Android smartphone or tablet, you should install Google Drive for Android. With the app, you can access the files in your Google Drive... Read More on your local memory. The function editing rules have been changed to make them simpler. You can also add new functions such as SUMIFS, COUNTIFS, and AVERAGEIF. You can perform amazing feats with Spreadsheet functions Perform Amazing Feats With These Useful Google Spreadsheet Functions Perform Amazing Feats With These Useful Google Spreadsheet Functions I am ashamed to admit that I've only recently decided to start experimenting with Google Spreadsheets, and what I've discovered is that whatever allure or power Excel had over me due to the amazing things... Read More . Spreadsheet now has filter views to quickly name, save and share different views of your data when you’re collaborating with others. Advanced conditional formatting lets you apply formatting based on cell contents or formulae. You also get coloured tabs, improved find and replace, and more. Finally, Google Spreadsheet is now faster and snappier than before and supports millions of cells. You can try out the new Google Spreadsheet by clicking here. Be warned that this only works with new spreadsheets you create after activating and will not retroactively work with your old spreadsheets. 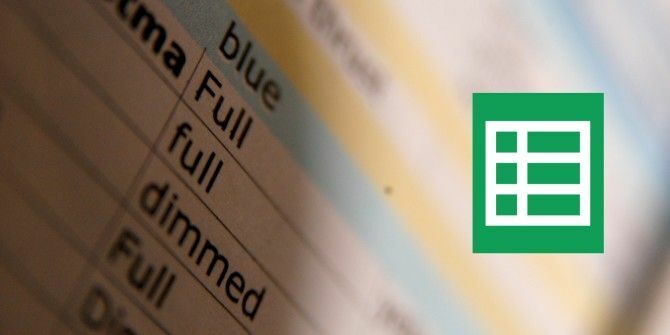 But we do have a handy guide to import data from other Google Spreadsheets How To Import Data From Other Google Spreadsheets How To Import Data From Other Google Spreadsheets Most users only use a small fraction of Google Spreadsheet's potential. Do you know how to get information from one Google Spreadsheet into another? Here's a cell function to do the job. Read More , so maybe that will help. Explore more about: Google Drive, Spreadsheet. Microsoft Office web apps is much better. Google will just plant ads all over your work and spy on you. Coincidentally, by the way, my file appears to have disappeared immediately after updating to the new Google Sheets. Though I can't prove that's the reason, of course. Well, I'm being cautiously optimistic about this. As an experiment a few weeks ago I set up a sheet of numbers and formulas so I could try to establish a good modus operandi for using cloud storage for this sort of thing. Fortunately it was a lot of bogus data I used, because the file, for all intents and purposes, has disappeared from Drive. I can't find it anywhere, and I've checked every machine I own in case I accidentally stored it offline instead of in the Cloud. If I find it...great. If I don't...I'm going to watch carefully to see if issues like this are recognized and addressed before I put very much faith in Drive. I really want it all to work...it's so convenient! But I will NEVER put sensitive financial information...or any other data I'd be afraid to have surveilled...out there. Sorry Google...your deals with the government will keep you from ever being utilized 100% for our storage needs. While I have no comment on the data scraping the " I also feel very uncomfortable with files just one email password away from prying eyes." comment is a moot point. That is just fear mongering and Google hate. While no security infrastructure is foolproof Google's is pretty damn good. 2-factor authentication and all. Google hate? Do you work for Google or just a bigot who interprets anything negative -- even voicing a reservation -- to be "google hate"?? We all have different comfort thresholds and yours is just as valid as mine (and vice versa). But for the record, I also don't use Microsoft office web apps for the same reason of security. But let the record show: if the security issue is resolved (that we can encrypt and decrypt our files online) -- then I will definitely consider using Microsoft and definitely NOT consider using Google -- not because of hate -- but because of the still lingering issue of data mining and selling! No thanks. I encrypt / password protect my spreadsheets -- which Google won't allow because it gets its money from scanning / selling your data to advertisers and trackers. Aside from having my files unencrypted with Google, I also feel very uncomfortable with files just one email password away from prying eyes. Try Team lab. They made it a year ago.